Enjoy those spectacular flavors of your farmers market or vegetable garden year round! Canning Parties are a fun, collaborative way to learn about the art and science of fruit and vegetable preservation. You supply the kitchen and the participants; we’ll supply everything else. In the end, everyone gets to go home with new knowledge and new goodies for their personal pantry. Each party plan is crafted to your individual interests, knowledge and kitchen space. You don’t need a gourmet kitchen or any fancy equipment! A sink, a stove top and some counter space are all we need to make it happen. Canning Parties are commonly held in an individual’s home, but might also take place in a community center, school or church kitchen – and the number of participants for your party is completely flexible based on the space available. 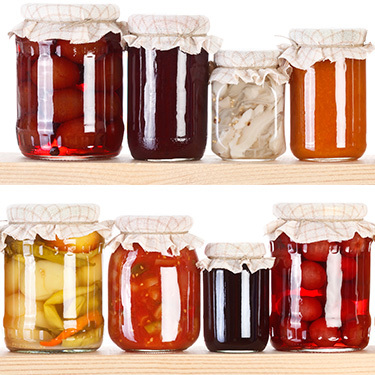 It is typical for in-home Canning Parties to include somewhere between 2 and 6 people, but with a larger space, 12 people or more is possible. Lucky Larder’s owner and produce preservation expert, Traci Stenson Hildner, leads our Canning Parties. She will arrive at your party with all the supplies needed to prepare and preserve your fruits and vegetables. And, when she leaves you at the party’s end, she’ll take all those dirty dishes with her. Prices start as low as $199 and vary depending on the processes you want to learn and the recipes you choose. Party topics may be quite general, like water bath canning or fermenting vegetables, or very specific, like canning spicy peppers or five ways to preserve apples. Do you have jars in the pantry or vegetables in the garden that you wish to use? We can incorporate them into your party plan. Want to learn more? Contact traci@luckylarder.com or 503-200-9219 for more details or to schedule your own Canning Party.